As manufacturing processes advance, the use of flammable and toxic gasses is increasing, along with the probability of gas leaks. The potential for industrial plants, employees, and first responders to confront these situations is also increasing with potentially deadly consequences, namely explosions, asphyxiation, and loss of life. A leak is an unpredictable abnormal release of gases or vapors of higher concentrations. A leak has to be regarded as an exceptional event of a relative short duration. In case of normal operation there is only clean air (without even low concentrations of the target gas or vapor). A gas detection system for leak detection is not to measure a gas concentration but to give alarm reliably if a preset alarm threshold is exceeded. A key part of any safety plan is properly identifying what gasses are present, installing the proper early warning detectors, and defining a comprehensive safety plan. The CAS-number is a worldwide used code to identify a chemical substance non-ambiguously. This is a unique numerical identifier issued to every chemical substance described in the open scientific literature (from 1957 to present) by the Chemical Abstracts Service. It the easiest way to characterize a chemical substance, including organic and inorganic compounds, minerals, isotopes, alloys and nonstructurable materials. The guide below, provided by Drager, is a very helpful reference document of CAS-Numbers. List of Detectable Gasses and Vapors by CAS-Number 2015 from Flow-Tech, Inc.
As with any critical process control or safety application, consultation with an applications expert is imperative prior to the selection or specification of any leak detection, gas monitoring, or safety device. Today there are many reasons to focus on energy optimization efforts. Due to rising cost of fossil fuels and environmental concerns, decreasing overall energy consumption, decreasing operational costs, improving HVAC performance, improving building quality and certification rating is becoming increasingly important. Facility Managers are stepping up their efforts to find efficiency and savings related to heating, ventilation and air conditioning systems, including chillers, boilers, and air-handling components. Energy-efficiency is a top priority for institutional and commercial organizations and will continue to grow in importance for the foreseeable future. Finding new ways to reduce energy consumption in buildings without compromising comfort and indoor air quality is an ongoing challenge. One of the most significant options a facility has is to add BTU energy metering that is able to accurately meter the new performance of upgraded chillers, pumps, and chilled water distribution system. Superior precision can be achieved by using clamp-on flowmeters with specially matched and paired ultrasonic transducers and temperature probes that control the heating and cooling flows within the building. These devices offer a superior solution with a high degree of reliability and repeatability for both temporary and permanent applications. The biggest challenge in retro-fitting flowmeters in existing piping structures are the very tight piping typical of chiller plants, existing valves, vents, and pipe bends. 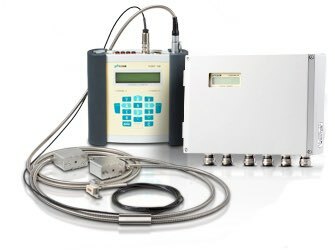 Clamp-on ultrasonic flowmeters provide an easy work-around. Since the clamp-on ultrasonic transducers are simply mounted on the outside of the pipeline, plant operation is not affected in any way during retrofitting. The reworking of existing piping systems for flowmeter installation is not required, making the clamp-on flow meters an ideal solution for retrofitting existing facilities. Designed with temperature compensation to eliminate inaccuracies or drift through deviations, and powerful correction algorithms to compensate for non-ideal pipe conditions, these energy flow meters offer an accuracy of 1% or better on the flow rate. Plus, low flow velocities can be detected reliably and accurately. Research demonstrates the addition and/or upgrade of metering existing HVAC systems can offer effective solutions for energy conservation and thermal comfort, with possible energy savings in the range of 30-40%. Thermal Dispersion flow and level switches are found in continuous operation in the most demanding and critical process and plant applications. This technology is the most preferred solution in oil and gas upstream and downstream applications; wastewater treatment; chemical operations; power plants, including nuclear power; food and beverage; refineries; mining; metals; manufacturing and more. Whether your application is for flow, level, flow + temperature or level + temperature, there is an thermal dispersion flow and level switches are available to meet your needs. The reasons for their popularity are clear. They were developed from more than 40 years of flow and level switch engineering and application experience to deliver the most reliable, repeatable, rugged and longest life industrial grade switch products found anywhere. Thermal Dispersion technology uses the principle of measuring the heat loss, or cooling effect, of a fluid flowing across a heated cylinder. A typical flow element configuration uses two RTDs, sheathed in thermowells, separated by a gap. Heat is applied internally to one RTD relative to the other, creating a differential temperature between the two. This differential temperature is greatest at no flow conditions and decreases as flow increases, cooling the heated RTD. Changes in flow velocity or immersion of the flow element into a liquid directly affect the extent to which heat is dissipated and, in turn the magnitude of the temperature differential between the RTDs. This differential is electronically converted into an electrical signal that can be used to trip a relay in flow or interface switch applications. Since the relationship between flow rate and cooling effect is directly related to mass in gas applications, Thermal Dispersion technology, combined with advanced signal linearizing circuitry, is used to provide a highly repeatable and accurate measurement of gas or air mass flow rates. Additionally, models are available with 316L stainless steel wetted parts that are electro-polished to 20 Ra, with a sanitary flange process connection meet the sanitary requirements of the food, beverage, pharmaceutical and chemical industries. The instrument’s "no moving parts" design makes it ideal for monitoring the flow of syrups, fillings and other viscous media and product slurries. 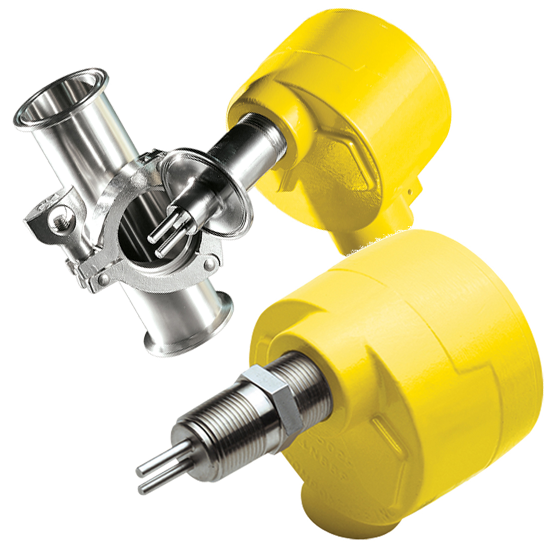 This design is suitable for both clean-in-place and steam-in-place applications. The development of condensate in super heater and re-heater drains leads to trouble in combined cycle and cogeneration plants with heat recovery steam generators (HRSGs). The need to reliably detect and measure condensate in these drain lines is just beginning to emerge. Heat recovery steam generators were never designed for cyclic service. The move toward renewable energy resources (such as wind and photovoltaic), in tandem with the ability of the combined cycle plant to start-up and stop quickly, is expanding the role of the combined cycle plant as a backup source of power. With frequent starts/stops condensate management becomes a problem. Draining this condensate is critcally important for the safe and reliable operation of the boiler. While the problem of condensate drainage has been around for years, the problem is far greater now with the more frequent start/stop cycle rates. The importance of finding a good solution for detecting condensate in the HRSG drain lines is growing. Boiler manufacturers address this situation through the use of condensate pots, levels instruments, site glasses, and valves. None of these technologies provide a satisfactory combination of reliability, economy, and efficiency. Knowing when steam converts to water is difficult with this approach. Plus, over cautious systems sometimes release steam instead of condensate, wasting energy. A more reliable and consistent way to sense the presence of water in drain lines had to be found. These clamp-on sensors work by measuring the transit-time difference of an ultrasonic signal, at varying flow velocities, through the process media. Ultrasonic, clamp-on flow meters have no moving parts, are not affected by density, and are mounted non-invasively directly to the pipe. The most challenging aspects of this application are the high temperature sensor exposure and the thick-walled pipes with small diameters commonly used for drains. To handle the high temperatures, specialized mounting and tooling were developed for the sensor allowing for pipe temperatures up to 750 deg. F. To overcome the small diameter / think pipe issue, Flexim engineers reconfigured the sensor’s firmware to change from measuring flow rate, and instead measure noise (decibels) as a innovative way to distinguish steam from water. 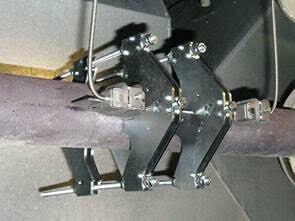 Flexim’s unique ability to measure the presence of liquid in condensate drain pipes is a revolutionary development. This valuable solution helps customers run longer and safer, minimizing downtime.